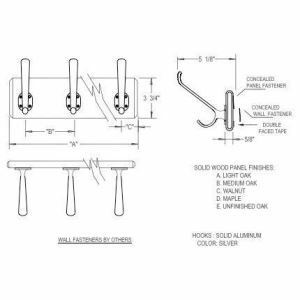 Hardwood hook panels are available in Maple, Light Oak, Medium Oak, Unfinished Oak, and Walnut, with 2,3,4 & 6 hooks per panel. They may be ordered with your choice of hooks or pegs installed. All panels are shipped completely assembled. Two hook panels have a depth of 5/8", a height of 3-3/4", and a length of 8". Three hook panels have a depth of 5/8", a height of 3-3/4", and a length of 12". Four & six hook panels have a depth of 5/8", a height of 3-3/4", and a length of 24". Note: Maple & Unfinished Oak are available in the 3-3/4" high panels only. 4 18” 5” 1 1/2"